The Ford Freestyle has been dubbed as a 'Compact Utility Vehicle' by Ford, and will be placed between the Figo hatchback and the EcoSport compact SUV when it launches. 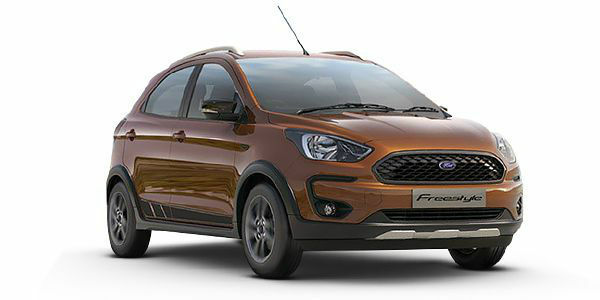 Ford India is all set to open bookings for its upcoming compact crossover, the Ford Freestyle. The 'Compact Utility Vehicle', as Ford calls it, falls somewhere between the Figo hatchback and the EcoSport compact SUV. 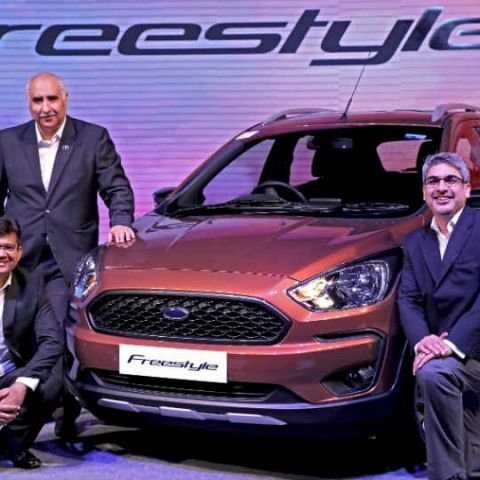 While certain similarities still remain with the Figo, Ford has taken steps to ensure that the Freestyle does not get badged as a mere Figo with rugged pretensions. It is this that the company hopes will draw in the bookings, which commences on April 7 ahead of its official launch. Inside the Ford Freestyle, the company has thrown in the SYNC 3 infotainment system in the top Titanium+ variant. This new infotainment system presently also features on the top variants of the EcoSport, and comes with a refreshed user interface, wireless telephony and audio streaming, integrated satellite-linked navigation, Apple CarPlay and Android Auto. Other advanced elements that will aim to pitch the Freestyle as a premium offering in comparison to what's on offer across the segment include automatic climate control, rain-sensing wipers, push-button ignition and steering-mounted controls for audio and telephony. It also gets a bunch of safety technology - some standard and some reserved for the top trims. For instance, dual-airbags, ABS, rear parking sensors and seat belt warning are standard across all variants, while side and curtain airbags are reserved for the Titanium+ trim. Advanced safety elements also include Active Rollover Prevention (ARP) alongside Electronic Stability Control (ESC). The Ford Freestyle will be offered in both petrol and diesel tunes, with a new 1.2-litre, 3-cylinder Dragon series petrol engine and the trusted 1.5-litre diesel engine that has been around in the Ford lineup for a while now. Power figures for the two engines are 95bhp/120Nm torque for the petrol one, while the diesel engine pegs in with 99bhp/215Nm torque. Rated fuel economies for the two engines are 19kmpl and 24.4kmpl, respectively. Only manual transmission variants are expected to be present at launch, although we do expect to see a six-speed automatic gearbox make its way to the Freestyle's lineup some time soon. The Ford Freestyle manages to include all the rugged plastic claddings that are becoming increasingly standard in cars like these, and not become overbearing. It gets a bold line that runs along the side of the car's body from the A-pillar to the C-pillar, and other such subtle character lines, coupled with black plastic elements around the front bumper, fog lamps, wheel arches, roof rails, skid plates and larger headlamps lead to a very balanced overall design of the car. The interior is expected to be in line with the new EcoSport, which has a similar dashboard arrangement along with the new floating infotainment display. The Ford Freestyle is expected to liven up a segment that has seen cars like the Hyundai i20 Active, Volkswagen Cross Polo, Fiat Punto Avventura and other such rugged hatchbacks. However, this segment has been since taken over by the likes of the Honda WR-V, Tata Nexon and Maruti Suzuki Vitara Brezza. The Freestyle will be slotting into this very active and high-volume segment of cars in India, and look to hold its own ground against its rival brands. Bookings commence on April 7, and the official launch will follow soon. What do you expect of the Ford Freestyle? Do let us know! What is the value of 7?